The Campaign Guide details the plot of the ZEITGEIST adventure path and introduces various antagonists and power groups. If you're planning on playing the ZEITGEIST adventure path (rather than running it), this guide will seriously spoil the experience for you. ZEITGEIST is a 13-part adventure path for the Pathfinder Roleplaying Game. This pdf is 19 pages long, 1 page front cover, 1 page editorial, 1 page map/ToC, 1 page SRD and 1 page back cover, leaving 15 pages of content, so let's check this out! This pdf contains GM-information and is chock-full of SPOILERS and intended for DMs only- this review, though, will refrain from mentioning any details. Since the basic concept of the AP is rather complex, the pdf comes with a concise run-down of the player's antagonists and better yet, the methods of the conspiracy the players will have to contend with. Better yet, since the AP presumes a mystery spanning multiple adventures, keeping the central plot-secrets as well as how to spoon-feed the handling of information and clues are covered - with a nice guideline by adventure for the PCs. The first five adventures also get a plot synopsis including scenes to whet our tastes for the modules including an option to abridge the campaign if need be. 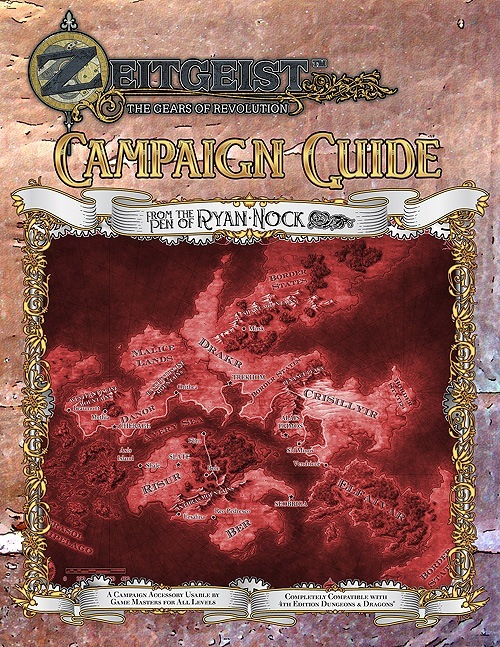 The pdf also features a full-page, beautiful map of the campaign world. Editing and formatting are top-notch, I didn't notice any glitches. Layout adheres to a beautiful 2-column standard and the full color pieces of artwork can stand up to the highest standards, though the lack of a printer-friendly version will mean that this pdf will put a brutal strain on your printer. The pdf comes fully bookmarked. This pdf is a great overview of the Zeitgeist-AP and the content makes one really run the AP, while providing first hints and advice on how to properly convey the leitmotifs and peculiarities of the saga. Seeing that this is a free pdf, I don't have much to complain about apart from the fact that I would have enjoyed a full campaign synopsis and perhaps a flow-chart diagram for the antagonists, but that's just me being nitpicky. This is a great free pdf and thus, I'll settle for a final verdict of 5 stars.